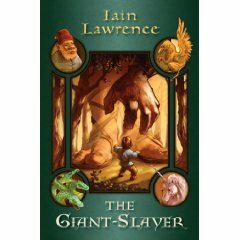 In March, the Book Club read The Giant-Slayer by Iain Lawrence. This tale, set in 1950's Massachusetts in the midst of the polio epidemic sweeping America, works on multiple levels. It is a historical fiction account of a specific time and place in history, with characters either battling polio or worried that they might get the disease. The main protagonist, Laurie Valentine, spends much of her time on the polio ward, visiting her sick friend. It is there that she meets the other patients in their iron lungs and begins to weave a magical story of a tiny boy (not young, but tiny) who sets off to slay a giant in order to gain acceptance. The back and forth narration, between the 1950's and a time long ago, keeps readers on their toes, drawing similarities between the past and present, and between their lives and those characters in Laurie's tale. As a group, we found this book to be well-written but too confusing for the grade levels we cover. The whole idea of polio is foreign to the group and much time was spent in discussing polio itself and the iron lung "treatment." The jumping back and forth between stories was also a little too complex. We'll wait and try to re-read this in a couple of years as the adults who read it just raved about the book!